As you begin to age, your ability to retain strong memories decreases. There are certain brain exercises you can do to keep your brain healthy and alert and fight memory loss. But did you know a good, sound sleep is also essential for memory development? What’s more, a new study has revealed that pink noise, white noise’s close relative, can actually help older adults increase their cognitive memory as they snooze. What Is Pink Noise and How Does It Work? 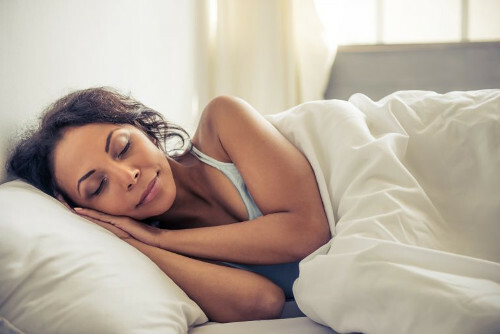 Researchers at Northwestern University in Chicago examined the effects of pink noise on the sleep patterns of older people, who are less likely to get deep sleep. What is pink noise exactly? It’s a soothing mix of high and low frequencies that has a balanced, natural sound—much like a rushing waterfall. For the two-night study, short bursts of pink noise were timed to match participants’ slow wave oscillations (deep sleep) on one night. No sounds were played during the other night. Results showed that the pink noise was actually able to increase the slow-wave oscillations of participants. Both nights featured a memory test, which was taken once before sleeping and again the next morning. Participants who listened to the pink noise performed three times better on memory tests than they did on the noiseless night. Scientists concluded that the degree of slow-wave sleep enhancement is related to the degree of memory improvement. That is to say, the more deep sleep you get, the better your memory gets. While more long-term testing is required before Northwestern University begins to market the technology for in-home use, they’re hopeful that pink noise could potentially become an aid to fight against precursors of dementia. This is just another natural way that you can work to improve your memory. Getting enough sleep, playing brain games, and eating right can all contribute to a healthy memory. You can also consider getting a sound therapy system with a pink noise option if you want to maximize your memory benefits while sleeping. Braun, R. et al., “Acoustic Enhancement of Sleep Slow Oscillations and Concomitant Memory Improvement in Older Adults,” Frontiers, March 8, 2017; http://journal.frontiersin.org/article/10.3389/fnhum.2017.00109/full, last accessed April 3, 2017. MacMillan, A., “The Sound of ‘Pink Noise’ Improves Sleep and Memory,” TIME, March 8, 2017; http://time.com/4694555/pink-noise-deep-sleep-improve-memory/, last accessed April 3, 2017. “Sound waves boost older adults’ memory, deep sleep,” ScienceDaily, March 8, 2017; https://www.sciencedaily.com/releases/2017/03/170308081024.htm, last accessed April 5, 2017.